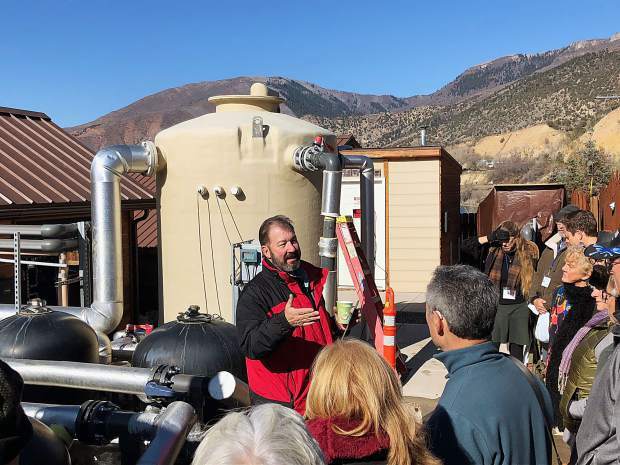 Iron Mountain Hot Springs co-owner Steve Beckley shows industry professionals the engineering setup for the resort, during a tour of Glenwood's hot springs facilities as part of a Hot Springs Connections conference for operators from around the country last week. After concluding the first annual conference of hot springs owners and operators in Glenwood Springs on Friday, tourism promoter Vicky Nash is ready to take the next steps in forming a trade association. For three days, 96 hot springs operators and owners representing 36 different thermal springs facilities from 13 states heard from experts and experienced managers about succeeding in the distinctive industry. The Hot Springs Connection, held its inaugural meeting in Glenwood Springs from Wednesday to Friday. Organized by Nash, who founded tourism data marketing firm Resort Trends, Inc., the aim of the conference was to gather owners and operators to share knowledge and build a network to help one another. “The group really wants to form an industry association so they have a network of people they can communicate with. We’re going to start that process,” Nash said. She plans to work with association managers to begin the process of setting up the board and bylaws. Nash will also move forward with a website to list every hot springs resort in North America. The site will likely have a buy-in for resorts to add additional information beyond a basic listing on the site. “Why reinvent the wheel? Someone said that yesterday, and it’s true. We’re all dealing with similar issues,” Mike Sommer, who is assisting South Dakota hot springs owner Kara Hagen renovate a resort that has been defunct since the 1940s. Each place where heated water bubbles up to the surface is an opportunity for something unique. In Glenwood Springs, that variety exists in a few square miles — from the sulfuric vapor of the Yampah caves, which the Los Angeles Times once described as something out of Dante’s “Inferno,” to the largest hot springs pool in North America filled with water from the Yampah that functions as a community gathering place, to the aesthetic soaking pools in view of the Colorado River at Iron Mountain. The owners of the three principal hot springs resorts in Glenwood — the Hot Springs Pool, Iron Mountain Hot Springs and the Yampah Spa and Vapor Caves — led the attendees through the back end of their businesses to show how the mineral-rich water gets from the ground to the guests. The diversity is good for the industry because it limits how much each resort competes with another, but it also means there are numerous ways to design and create the thermal springs resort and that can be daunting for the newcomer. “The operators have been so generous and friendly,” said conference attendee Nick Yoshida. For Yoshida, who plans to start construction on a new spa in the Columbia River gorge near Stevenson, Washington, the conference and the chance to ask questions of resort owners was quite timely. “We gained so much knowledge and direction in what we should be careful about. Everything from the locker room to the nitty-gritty of the engineering room, it’s been incredible. We’re very fortunate that this event happened,” Yoshida said. In addition to the advice of seasoned resort managers, other speakers included Walker Christensen, principal at DHM Design, who talked to the group about the complete renovation of the Ouray Hot Springs Pool and the firm’s work designing the adventure river and kids’ pool and splash pad now under construction at Glenwood Hot Springs Pool. Aquatic engineer Allen Clawson, managing partner at Cloward H2O, discussed water quality and sanitation, and Angie Fowler, of SGM engineering talked about meeting requirements for discharging water from hot springs pools back into rivers and water tables. One thing Seibel hopes to see from an association of thermal springs owners is help in educating the public, and even lawmakers, about hot springs. Legislators are “putting out laws that are very restrictive, but they don’t understand what is happening,” Seibel said. Each state has different laws, and a trade association could help owners navigate the regulations, he said. The big pool at Glenwood Hot Springs and the family pool at Iron Mountain must be chlorinated. Colorado statutes require water to be treated unless it completely cycles through a pool in two hours or less — as the 16 hotter soaking pools at Iron Mountain are set up to do. At the Glenwood Hot Springs pool, manager Brian Ammerman told the group about the challenges of keeping the big million-gallon pool of water at a consistent 92 degrees. Each hour, the operators take the temperature of the gravity-fed filter tanks and calculate how hot the water needs to be to keep the pool at the desired temperature. “You open up a little cold, a little hot, it’s all feel,” Ammerman said. Iron Mountain co-owners Mogli Cooper and Steve Beckley were open with the conference goers about some of the unexpected challenges they faced designing and building the resort. “We paid great attention to the details, like the color of our concrete. Oh, how proud we were we had a red color in our concrete. That’s an extra expense,” Cooper told one of the groups on the tour. But, the buildup of minerals from water splashed on the floors erased most of the hue. “After two or three years, it’s all grey on grey, so why bother?” Cooper said. The fossils embedded in the rocks bordering the pools also disappeared as the water eroded the surface of the flagstone. Part of what makes the bathing experience unique in Glenwood is how much the community participates in it, Seibel said. After visiting the Glenwood Hot Springs pool Thursday night, Seibel was inspired by the camaraderie he saw among the guests. Gathering as a community “is something that is very much lost,” Seibel said. That’s true even at his own hot springs location, he said. “People talking to each other, getting them out of their houses and gathering in a location. That’s what we see as the big difference here,” Seibel said.